Balance is dependent on eye sight, inner ear signals and neural information sent to the brain from the muscles and joints. Recent studies showed no difference in rate of loss of balance on a firm surface with eyes open or eyes closed. The first reflexive muscular response when someone stumbles forward is for the foot to move into a plantar flexed (forefoot down) position. The Vestibular system or inner ear processes the neurological signals to maintain balance in humans. Good balance is vital for healthy lifestyles now and in the future. As we age, a habit of strengthening balance can protect us from costly falls and other health problems. Strong balance is actually a physical skill that requires proper neurological “firing”, good eye sight and adequate strength throughout the musculoskeletal system. If any of these traits are inadequate, balance can be negatively affected and a fall can result. Training the nervous and musculoskeletal systems can greatly enhance a person’s balance. What is good balance? This is the ability to control your body position whether it is stationary or moving. Balance exercises should be as important as building muscular strength, endurance and flexibility. Unfortunately, not everyone has a fitness routine and there are more people that don’t exercise on a regular basis. These people are susceptible to balance issues as their bodies age and become deconditioned. Eye sight can be changed with surgery or wearing glasses. Neurological response can be trained to a certain extent and building strength can occur in everyone providing their nervous system is intact. Building strength and muscular endurance requires a consistent exercise routine performed for a prolonged period of time. 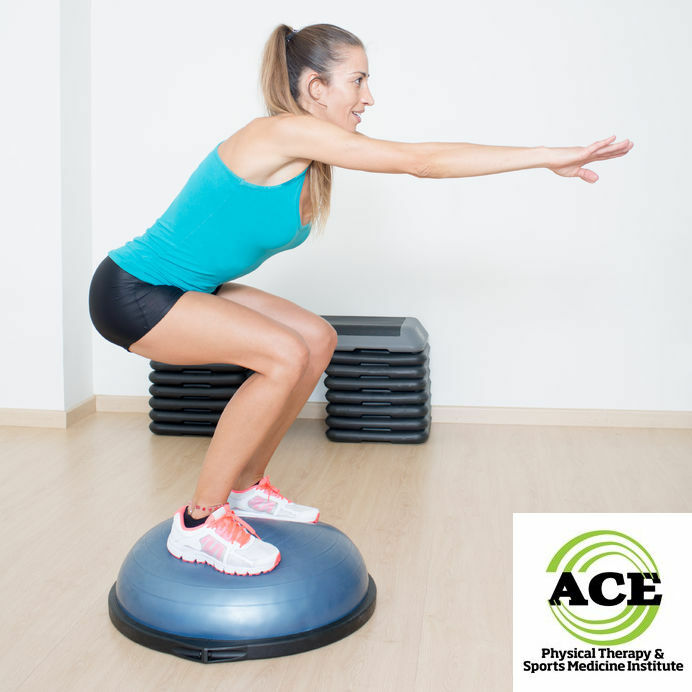 There are basic core and lower extremity exercises that can be performed by anyone to help develop the strength and endurance that will enhance someone’s chances of avoiding a balance problem. There are certain exercises that can be performed to build strength and help to “train” the nervous system at the same time. Improved Body Awareness – Knowing where all of your body parts are at any given time. Your nervous system has to “record and control” the muscles and joints. Coordination of Movements is closely related to body awareness. The balance training routine stimulates and educates the nervous system to be more efficient. The efficient control of the joints and muscles makes motions smoother and “under” control. If the body awareness and coordination are adequate, the joints are stable and less likely to be injured. Studies have shown that a stable joint is less likely to develop arthritic changes, also. When everything is working well, a person’s reaction time is sufficient to avoid slips and falls in many instances. With proper body awareness and coordination, most individuals are able to sustain a healthy life. There are a few exercises and drills that are geared towards enhancing one’s balance that are easily performed almost anywhere. Bridges: Lie on a firm surface and bend your knees so the soles of your feet are flat on the surface. Cross your arms on your chest and lift your buttocks off of the surface. Hold for 3-5 seconds and then lower down to the firm surface. Repeat 15-20 times per day. Squat: Stand in front of a chair and pretend that you are going to sit down in the chair. Lower your buttock to the seat and barely touch. Be sure to move your buttock back towards the back of the chair and try to keep your kneecaps behind your toes. After touching the seat, stand up. Do not use your hands on the way down or up unless you do not feel steady or safe. Repeat 15-20 times. Sidestep: Stand side-ways in a hallway. Walk side-ways down to the end and repeat each way several times. Always remain facing the same direction during the drill on that given day. Balance on one foot: Stand on one foot for as long as you can. Repeat with the other foot. You should stand near a counter or in a doorway so you have something to grab on to if you lose your balance or feel unsteady Repeat several times on each foot. Walk down the hallway heel to toe: Stand near the wall in the hallway and begin to walk straight ahead placing the heel of one foot directly in front of and slightly touching the toes on the other foot. Repeat the entire length of the hallway and repeat several times. These exercises can be done very easily in the privacy of your own home. If you feel that it would be beneficial to speak with a healthcare professional seek the advice and treatment from a Physical Therapist. These licensed healthcare professionals are well trained and educated in exercises and drills that will enhance someone’s balance. They will develop a routine that will train the nervous system and strengthen the muscles. Balance is needed to live a healthy life! The lack of balance can lead to severe injuries and in some cases even death. Addressing body awareness and coordination of movements is vital to individuals of all age ranges. Younger and older individuals could benefit from being able to put their body parts efficiently in space decreasing unnecessary wear and tear on joints. After all, we all need BALANCE in our lives. And the list of exercises provided gives great ideas that can be performed at home with no extra equipment! Thank you.